The new abrasive bulk transfer system ABRALINE Adv. (Bad Nauheim, 2013-02-06) With the ABRALINE abrasive bulk transfer system, KMT Waterjet Systems offers a solution to enable quick and economical waterjet cutting. The latest addition to this product line is the model version ABRALINE Advanced which features a larger abrasive silo and an optimized design. Thus, it is able to reliably feed demanding waterjet cutting applications. The use of such a system pays off: When cutting with a waterjet, a smooth abrasive feed is very important – especially for brittle material – as only a continuous abrasive flow guarantees optimal cutting results without material damages. The abrasive bulk transfer system ABRALINE for waterjet cutting machines consists of an abrasive silo and a smaller pressure vessel directly beneath it. With the help of pressurized air, the vessel conveys abrasive sand to the waterjet cutting heads via a hose. At the outlet hopper of the pressure vessel, a sensor monitors the fill level of the abrasive. As soon as the abrasive runs low, a signal of the sensor causes a time-controlled opening of the inlet valve which replenishes the tank thus providing a continuous abrasive flow to the waterjet cutting heads. For some years, KMT has been successfully selling the ABRALINE system in the market. Now, the company has extended the product line by a model which has been designed especially for waterjet cutting machines operating at full capacity: The model ABRALINE Advanced features an extremely large abrasive silo. Therefore, a single abrasive load lasts more than twice as long as a single load of the smaller version of the transfer system. The silo has been dimensioned to be able to hold a complete abrasive sand standard packaging unit of 1 t. This fact does not only lead to longer continuous operation times of the connected waterjet cutting machines but also to a time-saving and simple filling process of the silo as the necessity for an intermediate storage of the abrasive is eliminated. 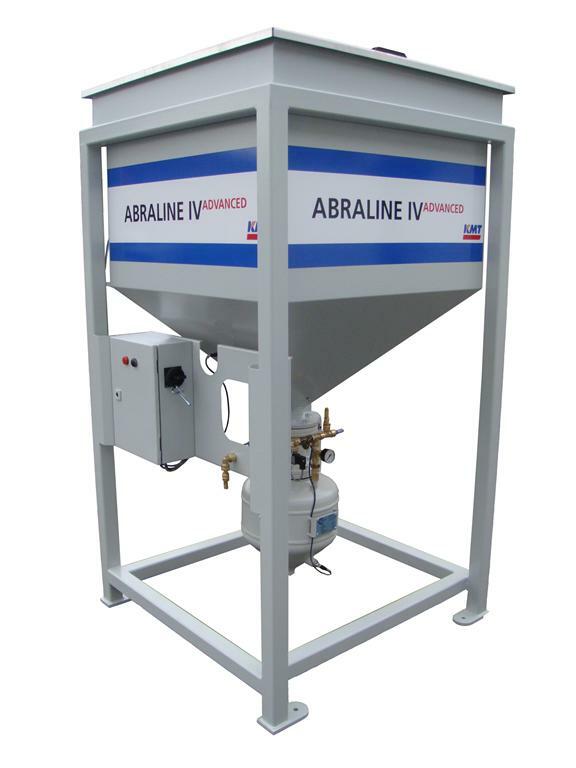 Moreover, the model ABRALINE Advanced is very maintenance-friendly and reliable: Instead of using a usual cone seal, the abrasive silo and the pressure vessel are connected by a pneumatic pinch valve. A free production flow, minimum frictional resistance and the absence of leaks and clogging are some features of such a valve which allow for long lifetimes even at continuous operation. Furthermore, the opening and closing of the pinch valve require a lower air volume compared to the cone seal. As a consequence, the necessary maximum level of air pressure decreases significantly. With the two model types, KMT offers a solution for different requirements concerning waterjet cutting systems. The smaller version ABRALINE Comfort is sufficient for ensuring the abrasive feed for occasional cutting needs. For larger waterjet cutting machines which operate continuously and with multiple waterjet cutting heads, machine operators should consider using the model ABRALINE Advanced. For many years now, KMT has been working on building up an exemplary international network of local representations with the aim to always be close to its customers. Considering this philosophy, the company decided in 2012 to maintain a presence in Russia. Consequently, KMT opened up a sales and service office in Moscow on 1 January 2013. Hence, KMT establishes a permanent customer contact to be even better able to serve its existing Russian customers and to further strengthen its position in this attractive growth market. So all of those who are interested in waterjet cutting gain a designated contact person who can cater to all customer demands in the national language. 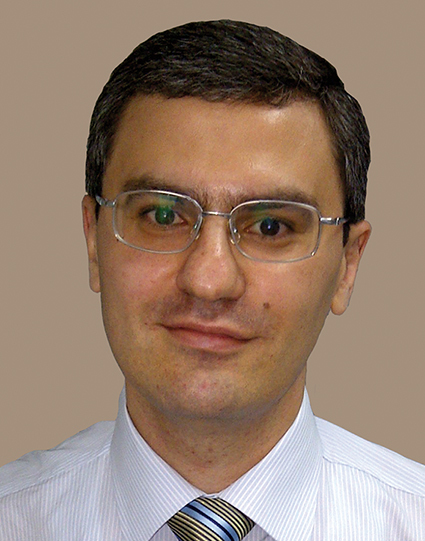 Since the beginning of the year, the newly appointed Area Manager Russia, Vartan Mazyan, has been serving the sales areas of Russia and Cenral Asia from his office in Moscow. Mazyan was recruited on 1 September 2012 and participated in a comprehensive training in the company headquarters for Europe, Middle East, Africa and India in Bad Nauheim, Germany. Now, he is ready to proficiently answer all of his local customers’ questions and requirements concerning waterjet cutting.